Armenian rebels in Van remain under siege. Refugees from the countryside are flooding into the city, apparently being allowed through the Turkish lines. Perhaps the Turks want to stretch the demands on Van’s food supplies to the maximum extent. Or perhaps it is also convenient for them to have as many of the Armenians as possible in one place. 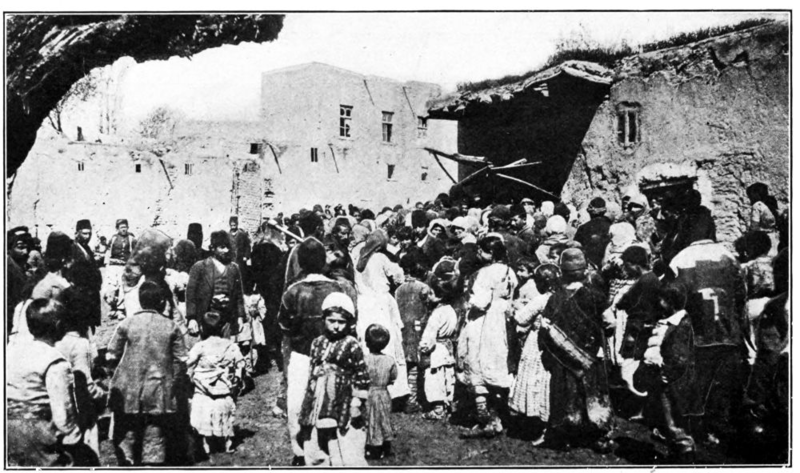 The Armenians in Van are able to repel assaults by the Turks, but they cannot hold out indefinitely. Food shortages will eventually become a problem, but in the immediate term the defenders’ big problem is shortage of ammunition. The defenders are ordered to use ammunition as sparingly as possible. Fortunately help is on its way. Messengers have been sent to the Russians revealing the town’s plight. Van’s pleas do not go unanswered. Today Russia’s General Yudenich orders a force of Cossacks and Armenians to march to the aid of Van. 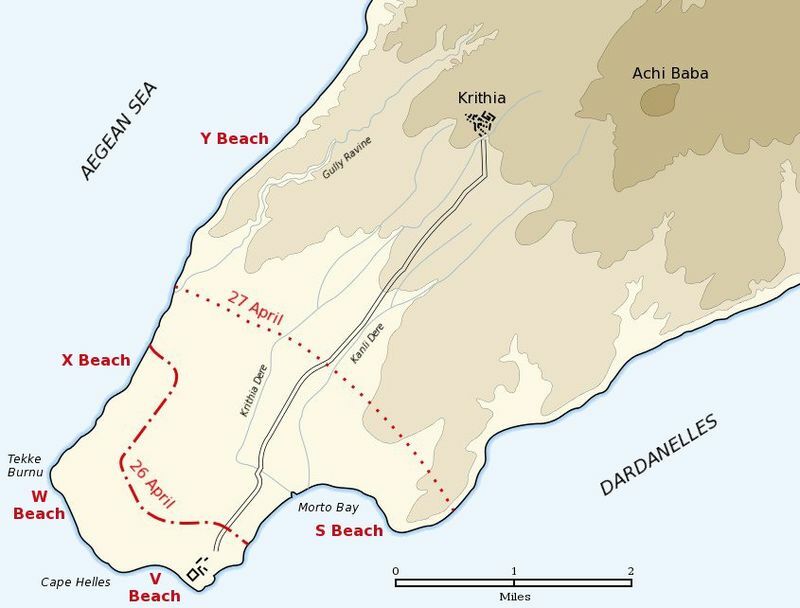 At the southern tip of the Gallipoli peninsula British and French forces manage to link up their beach heads and try to push north. They are blocked a few miles from the beaches and can make no further progress. Further north it is the Turks who are attacking. Kemal is throwing every man he has against ANZAC Cove, hoping to drive the Australians and New Zealanders into the sea. The fighting is brutal and the ANZACs come close to collapse, but with the support of naval guns they are able to hold off the Turks. Even if the beachheads are now secure, the prospect of a quick Allied victory now seems remote. The landings were made to put Turkish shore batteries out of action, allowing British and French warships to sail through the Dardanelles and on to Constantinople. But the Allies underestimated the tenacity of Turkish resistance. Gallipoli looks like becoming a long, grinding battle of attrition. Italy’s leaders have been negotiating with the Allies on the terms of its entry into the war. These negotiations finally bear fruit. In London, representatives of Italy, France, Russia and the United Kingdom sign an agreement. 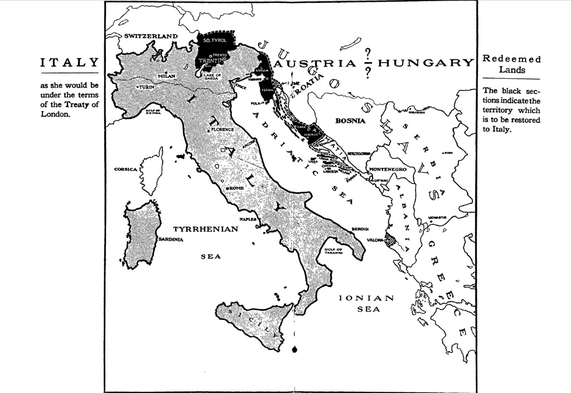 Italy will enter the war within 30 days in return for territorial gains at the war’s end. The Trentino and Alto Adige (or South Tyrol) regions will go to Italy, as will the port of Trieste and territories around it. These areas all have some Italian-speaking people living there, though there are also many German speakers and Slavs. Italy will also receive territories along the Dalmatian coast, though not as much as its leaders would like. The port of Fiume is to remain in Austro-Hungarian hands, while Russia has insisted that southern Dalmatia be granted to its Serbian or Montenegrin allies after the war. Italy is also to gain the port of Vlorë in Albania and a protectorate over the rest of the country (currently in a state of some disorder). 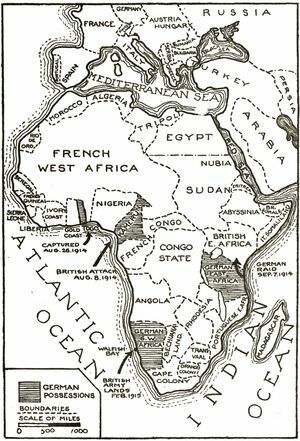 Vaguer promises are made about Italy getting its share of Germany’s African and Asian colonies after the war’s end. The terms of the agreement are to remain a secret. Turkey’s control of the entrance into the Black Sea has cut Russia’s main trade route with its western Allies. This is a problem because Russia’s weak industrial base is unable to keep the army sufficiently supplied with the materiel it needs to fight this terrible war. Seizing control of the straits leading into the Black Sea would allow British industry to equip Russian armies. And a well equipped Russian army should be able to overwhelm the Germans and bring the war to a swift end, or so the optimistic thinking goes. A combined Franco-British naval force attempted to push through the Dardanelles and on to Constantinople on the 13th of March. That attack failed because of Turkish minefields. Fire from shore batteries prevented British minesweepers from clearing a safe path. Once the naval attack failed the Allies realised that they would have to invade the Gallipoli peninsula to seize the Turkish forts and allow their minesweepers to clear a way through the minefields. The Allies began to prepare a ground force to land on the peninsula. 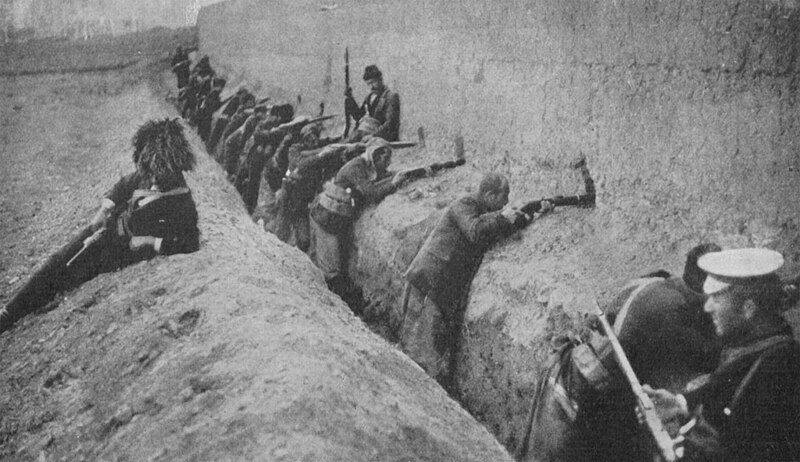 The Turks also realised that an invasion was likely and began to strengthen their defences. Now at last the Allies are ready to attack. General Ian Hamilton commands a multinational force of British, Australian, New Zealand and French troops. The plan is simple enough. 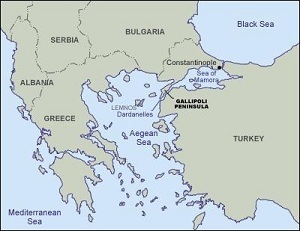 British forces are to land at the southern tip of the Gallipoli peninsula and march to destroy the Turkish positions on the western shore of the Hellespont. Australian and New Zealand units (grouped together as the Australian and New Zealand Army Corps, known as ANZAC) will land further north and march across the peninsula to cut off the Turks in the south. The smaller French contingent will carry out diversionary operations. Things do not go according to plan. Barbed wire and determined Turkish resistance mean that the Allies suffer terrible casualties and struggle to get off the beaches. The Turkish forces in Gallipoli are commanded by the German general Otto Liman Von Sanders. His steady manner calms nerves and prevents a panic at the top. 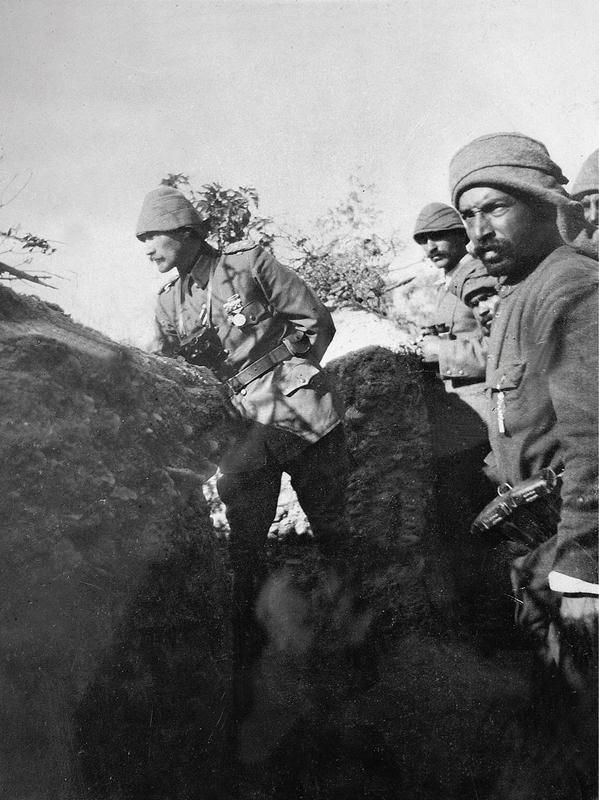 Further south, Colonel Mustafa Kemal commands the 19th Division near where the landings are taking place. When a Turkish regiment facing the Australians and New Zealanders reports that it is running low on ammunition and in danger of being overwhelmed, Kemal orders them forward. “I do not order you to fight,” he apparently says. 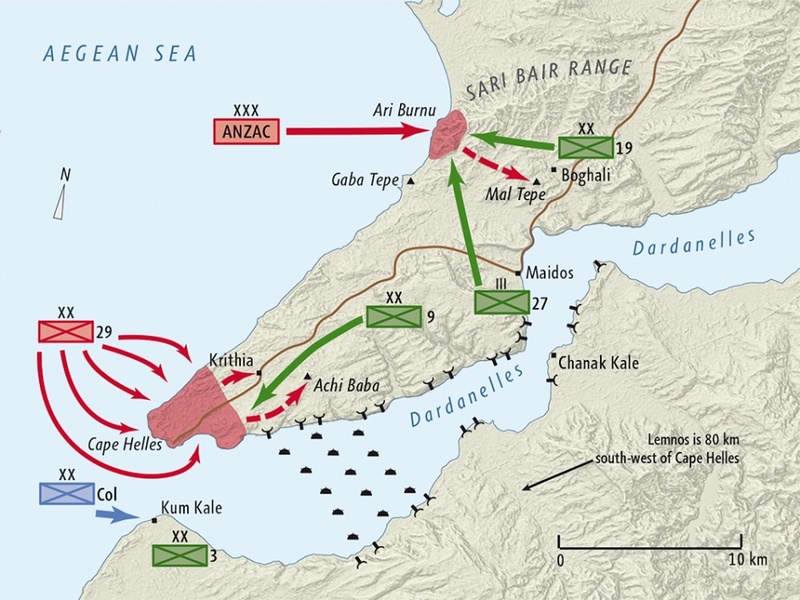 “I order you to die.” The Turks fix bayonets and attack; they are wiped out almost to a man, but they succeed in delaying the enemy advance long enough for other Turkish troops to occupy the high ground and contain the enemy in what will become known as Anzac Cove. By the end of the day both sides have suffered terrible casualties but the Allies have clearly failed in their objectives. They have two separated narrow beachheads from which they will only be able to advance with the greatest difficulty. It seems they have merely replicated the the stalemate of the Western Front here in Gallipoli. The situation is so desperate that some of Hamilton’s subordinate commanders petition him to order an evacuation. But the commander is confident that the worst part of the operation is over and that perseverance will lead to victory. The gas attacks of the 22nd seem to have stunned the Germans as much as the Allies. Despite ripping a hole in the Allied line they have failed to exploit the advantage gained. 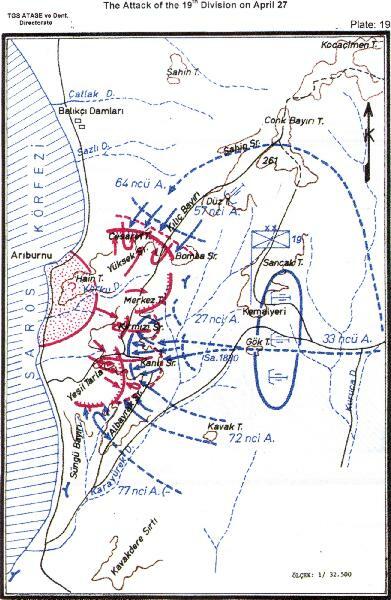 Today, though, they renew the offensive, attacking towards the village of Saint Julien. The Canadians bear the brunt of the German attack, though British and Irish troops are also engaged. The Germans use gas again against the defenders of St. Julien, but the novelty of this terrible weapon has worn off. It no longer strikes quite such terror into the Allies, particularly now they have improvised counter measures. Urine soaked rags held over the face provide a reasonably effective if unsavoury defence against the effects of chlorine gas. The Allies are able to block the Germans from advancing to Ypres itself. In truth, the German forces are not particularly strong. They lack the reserves to exploit the successes of the 22nd. For all that Falkenhayn threw men with great profligacy at Ypres last year, this battle is just a diversion. Despite his belief that the war can only be won in the West, the German supreme commander has acceded to the request of his eastern commanders to send Germany’s reserves to the East. 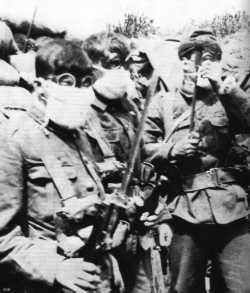 For Falkenhayn this battle is just an opportunity to test out poison gas and to trick the Allies into thinking that Germany is still focussed on the Western Front.